This chicken has been so easy and such a lifesaver in my busy life. Most of the kids all love it and it is dairy and gluten free yay! 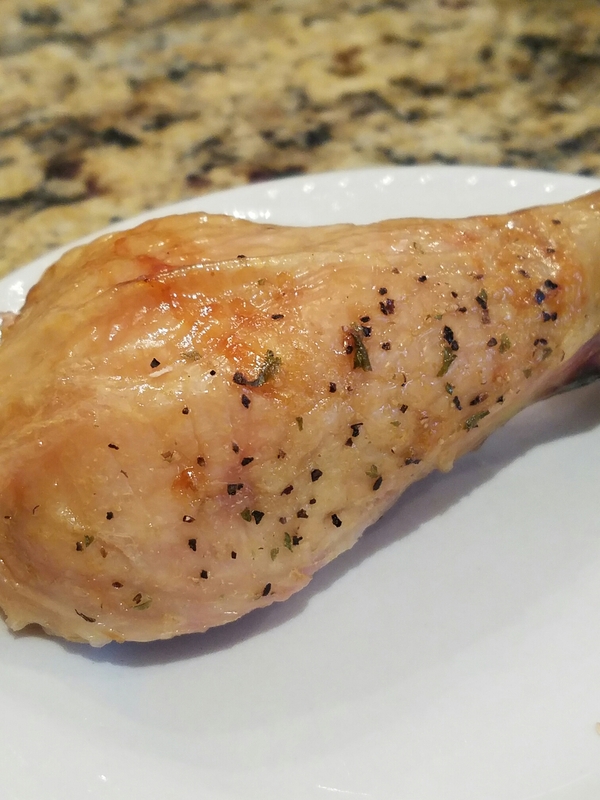 So really easy…I get 2 mini whole chickens….place them in the pan and pour a small amount of olive oil all over the chicken. Then in another bowl mix salt, black pepper, garlic powder, thyme and parsley. Sprinkle a generous amount all over the chicken. Bake uncovered at 400 degrees until the top is browned. Place tin foil on top of the chicken and then cook the chicken until done at 325 degrees…I always Google it to remember the correct temp…then eat and enjoy! Some little kids don’t like the hotness of the spice mix for the chicken…you could cook one without so many spices..little kids sometimes don’t like all that stuff;) I know from experience! The picture above doesn’t have as many spices as I usually use! Either way, this is really good. I usually cook this when I know I’ll be home most of the day while it cooks. When it’s done, I baste it with the chicken juices after I cut into it..this makes it so yummy! Thank you for liking my post. Happy safe cooking! Wonderful ideas! Thank you, never thought of saving the juices, you say freeze them or just refrigerate them? And pricking the chicken while basting good idea….do you baste the juices onto the chicken while it is cooking? I don’t baste the juices because hubby likes his chicken crispy ^^. (Actually it’s his recipe 🙂). I actually freeze the juices. I get the jar out of the freezer about five minutes before using so the spoon can go in! Haha yes! You can have some;) maybe so, maybe I try without the baking powder…or maybe I should add more rice milk to make them thinner..they are supposed to be more like a crepe..but I’m not patient enough to always measure things perfect..that could be the problem. Would love the crepe recipe!